NOTE: Each disc is individually dyed with bold colors and exciting designs. No two are exactly alike. Photo shown as examples. The Wraith is a long stable Distance Driver with speed, glide and accuracy. This Wraith can provide great distance for players of all skill levels. It is an excellent downwind driver that also performs predictably into the wind. NOTE: Each disc is individually dyed with bold colors and exciting designs. No two are exactly alike. Photo shown as examples. Best Choice for: Maximum Distance, long hyzers, tailwind drives, intermediate to advanced players looking for the ultimate distance disc. Add a unique color to your game with I-Dye discs! Each disc is individually dyed with bold colors and exciting designs. No two are exactly alike. These discs are attractive enough to display on your walls, yet much more fun to watch flying down the fairway. The I Dye process is hand applied by an individual artist who strives to make each design intriguing and vibrant. I Dye designs are not on the disc, they fuse into the plastic making them resistant to scuffing. No two are alike and there are many different dye designs, so find one you like and go throw! 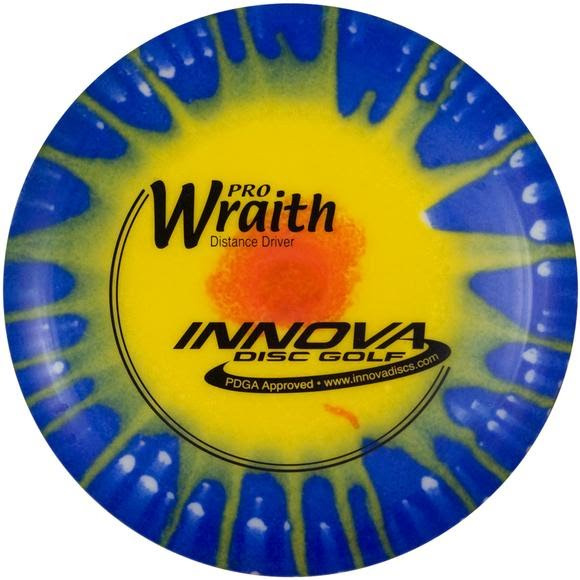 INNOVA&apos;S Pro Line is manufactured using a special blend of plastics and are designed to provide unique qualities for each available model. These quality discs offer increased durability over discs made in our DX plastic and provide an enhanced grip when compared to the Champion plastic. Our Pro Line of discs provide additional glide when compared to all our other disc lines and are more affordable than our premium Champion Line discs. The special blends of our Pro Line plastic can produce discs in a wide range of rigidity, from the extremely soft and flexible Pro Rhyno or JK Aviar to the stiff, firm plastic of the KC Pro Aviar. Regardless of the firmness of the disc, all of the INNOVA Pro Line models offer unique gripablity.